Take out a subscription to New Start, the magazine for making better places. New Start is a monthly ezine covering economic development, regeneration and sustainable communities. New Start is a creative and informative magazine, but it's more than that: it's an online hub, a recruitment aid, a partner for organisations wanting to spread learning and to showcase good practice, and the place that the sector's leading thinkers use to kick-start a debate on key issues. Every issue of New Start magazine aims to inform and inspire. A subscription provides readers with an invaluable tool: keeping them up to date; showing them how the latest policy affects their work; and demonstrating helpful, practical examples of successful economic development and regeneration. 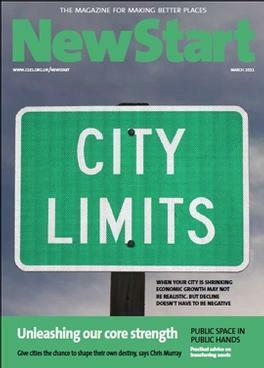 New Start is widely known as the "the leading publication for making better places". The magazine is now part of the Centre for Local Economic Strategies (CLES), the UK’s leading membership organisation dedicated to economic development and regeneration. Subscriptions are wrapped up with CLES membership so you can also enjoy a wide range of benefits including access to CLES research and publications, discounts on training and consultancy as well as access to information and expertise. Subscribe to New Start Magazine today and save 20% off the cover price. Be the first person to tell us what you think about New Start and you'll save £2.50 on your next purchase!